Azerbaijan’s legal and regulatory framework generally requires availability, access and exchange of all relevant information in tax matters in accordance with the international standard. however, the Phase I review identified the need for improvement in certain aspects of legal and regulatory framework. In this regard, Azerbaijan should ensure that an appropriate mechanism is put in place to ensure the ownership information for bearer shares that could have been issued by joint stock companies prior to 15 July 2015. Azerbaijan should also ensure that all entities maintain accounting records for a period of at least 5 years and maintain underlying documentation. On access to information, Azerbaijan should clarify its laws to remove any obstacles in accessing information and ensure that the its competent authority’s access powers are in line with the international standard. At present, Azerbaijan’s network of EOI mechanisms covers 101 jurisdictions and Azerbaijan is continuing to negotiate further agreements to extend their EOI network. 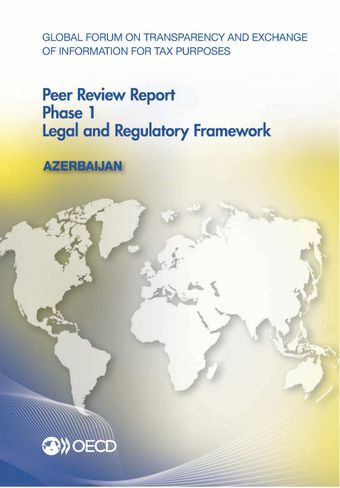 The response of Azerbaijan to the recommendations in this report, as well as the application of the legal framework to the practices of its competent authority will be considered in detail in the Phase 2 Peer Review of Azerbaijan which is scheduled to commence in the fourth quarter of 2015. For further information on the exchange of information practice of Azerbaijan and to read the full report click here.